This is an archival video taken on Sleepy Creek at Johnson’s Mill, April 20, 2015. This was after we had a two-inch rainfall across the entire region the night before. There was considerable flooding along Sleepy Creek’s main tributary (the video) and its branches. 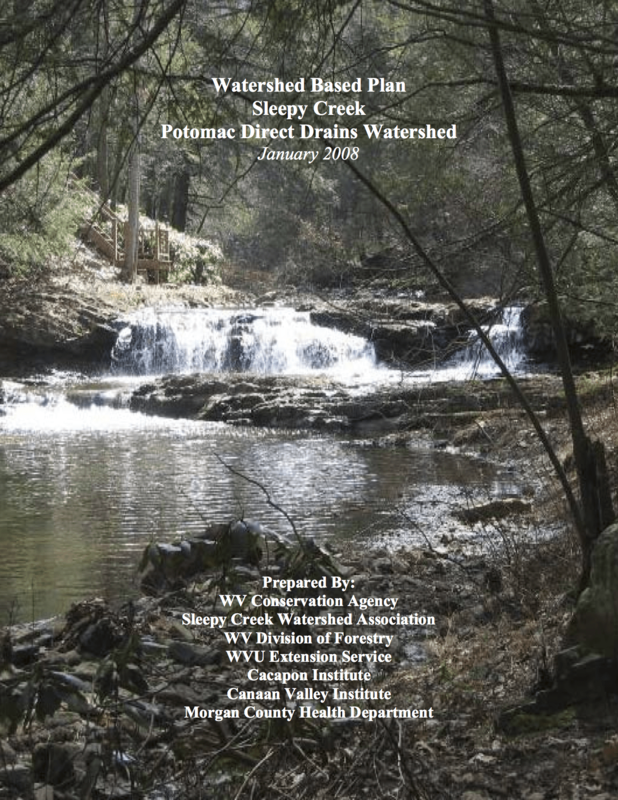 Here you can find out all the details about the Sleepy Creek Watershed-Based Plan and how it relates to Sleepy Creeks’ drainage into the Potomac River. Click on text below to read entire file. Sleepy Creek Watershed: Defined and described, click “SC Watershed Description” below for details. 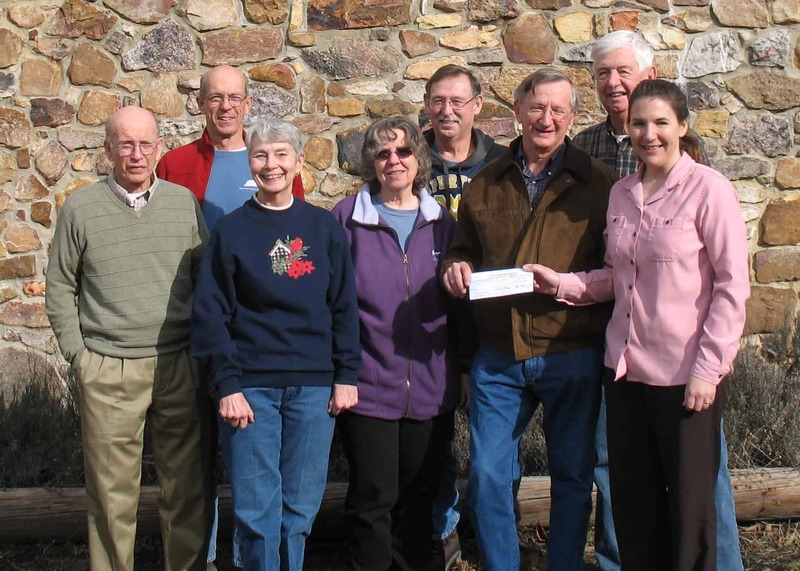 The Sleepy Creek Watershed Association received a $2,500 grant from the West Virginia Stream Partners to upgrade the organization’s webpage for increased community outreach. Alana Hartman of the West Virginia Department of Environment (far right) presented the check to new Board President Charles Marsh on January 13, 2014. Other directors are front row: Norman Dean; retiring President, Gale Foulds; and Susan Jones; back row: Secretary, Stanley Oaks; Treasurer, Robert Meadows; and Vice President, James Michael. 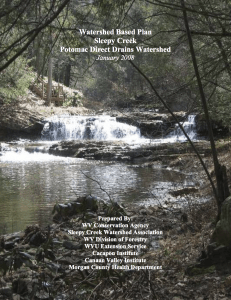 In the spring of 1999, Abby Chapple, then president of Friends of the Cacapon River, asked me to start a watershed association for Sleepy Creek. Since there had once been a ‘Friends of Sleepy Creek,’ we decided to call the new organization Sleepy Creek Watershed Association. She helped me find board members and introduced me to Jim Michael, Charles and Margaret Biggs, and Elaine Macintyre. 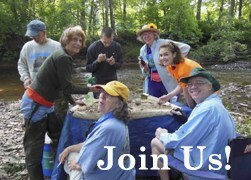 Elaine was Secretary and later became the newsletter editor and selected the turtle as our logo. Pete Pitepeere was vice president. Kris and David O’Brien, and Rebecca McLeod, were also vital to the organization. Our first cleanup was along Burnt Mill Road and because we didn’t have many members, we asked the Boys & Girls Club to help out. It was a fun day and we picked up a lot of trash. See photo at right. By 2000, we were a little more organized & joined the Make-It-Shine program that took place all across the State. We had gloves and trash bags donated to us and cleaned up along Sleepy Creek again. In the fall, we participated in our first Apple Butter Festival and set up next to Friends of the cacapon River, in front of Hunter’s Hardware. At the end of the year, we had an election of officers and Gale Foulds was elected President. The year 2001 was the beginning of great things. Gail started off by getting us involved in the Great American Cleanup and we worked along Sleepy Creek at the bridge on River Road. In May of 2001, the first draft of the Association Bylaws was completed and we began the process of becoming a 501(c)(3) organization.